Hope Industrial Systems Industrial Operator Stations are designed to provide a low-cost platform that can be configured in more than 12,960 ways. 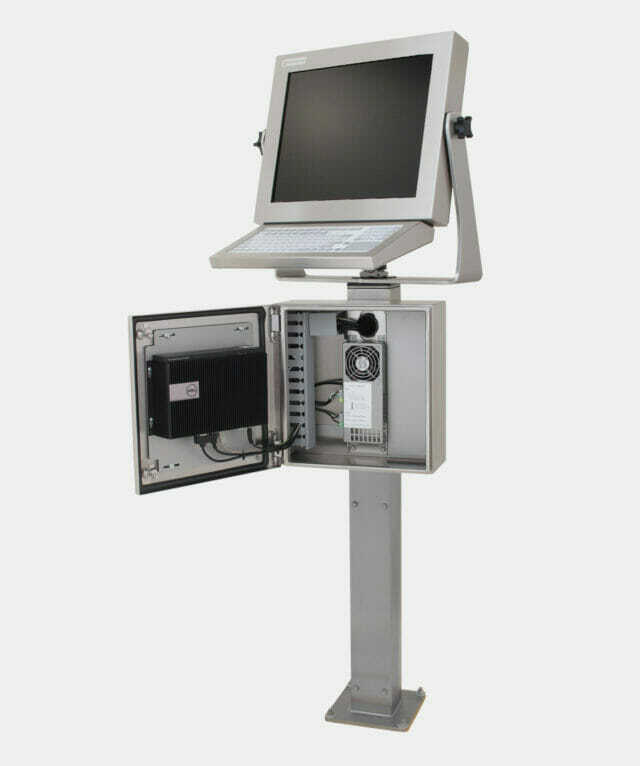 Our workstations consist of an industrial Universal Mount Monitor, cable exit plate option, and monitor mount. Other optional accessories, including PC/thin client enclosures, keyboards, and KVM extenders, are available depending on your requirements. When combined with a PC/thin client enclosure, these workstations offer a sealed, clean, and cool operating environment for any user-supplied PC or thin client – even in full wash-down environments. All operator station components are supported by a 3-year warranty and most are in stock and ready for same-day shipping. Select a display and necessary cable exit and cables. 15″, 17″, 19″, 19.5″, 22″, and 23″ Universal Mount Monitors are available. We offer multiple cable exit options, depending on the cables your application requires. Select a mount for your industrial monitor. Heavy Industrial Mount options include Wall Yoke and Arm Mounts, Benchtop Yokes, and Pedestals (available in IP65/IP66 stainless or black powder-coated carbon steel). VESA Mount options include Radial Arms, Wall Mounts, and Benchtop Stands. Select a monitor-mounted keyboard. Keyboards are available with full and short-travel keypads with touchpad or button pointer mouse options. Enclosures are available in IP65/IP66 stainless and black powder-coated steel. USB or PS2 interface connection options. Choose a PC/thin client enclosure. Thin Client/Small PC Enclosures include integrated cooling, DC power supply, and cable routing. Commercial/Industrial PC Enclosures include AC power distribution, cooling options, and an internal service panel for custom devices. Enclosures are available in IP65/IP66 stainless and black powder-coated steel. Contact us for a quote based on your specifications.